Many years ago, Wendy’s made a commercial that everyone at the time knew by heart. It was about their chicken sandwich. The premise of the commercial was that they sold 100% chicken breast in their sandwiches, and alluded to their competitors that use 100% chicken, but use other “parts” of the chicken in their sandwiches. The commercials message was about “parts are parts”. You can view the Youtube video here. So this months blog is about, you guessed it, parts. Not parts used in chicken sandwiches but rather parts used in the collision repairs to your vehicle. We have been caught in the middle multiple times when a vehicle owner was told by the insurance company they were getting “new” parts, or “replacement” parts to repair their vehicle. Most vehicle owners have visions in their minds that this means new “Original Equipment” parts that come from the manufacturer of their vehicle. Although the insurance company is right in that they are getting new or replacement parts, it could be said that they are misleading the consumer due to the multiple categories of new and replacement parts. Yes, parts are parts, but there are different kind of parts just as in the Wendy’s commercial. Let me explain. We need to break down the parts categories that will likely play a role in the repairs to your vehicle. Here are a few basic definitions. OE: This stands for Original Equipment which means these parts are made for your vehicle by the car manufacturer or their vendor according to the original equipment manufacturer’s specifications. These parts are purchased at the dealer that sells the new vehicles. Pretty simple. Aftermarket: These are “new” parts but are not made by the manufacturer of your vehicle. They are made by a third party based on information they obtain about OE parts, but not necessarily to the manufacturers specifications. Mostly these parts are made overseas and are cheaper in price. This is very attractive to insurance companies as they are always looking for ways to lower their loss exposure. Opt OE: This is where it gets even more confusing. No one really has a true definition for Opt OE. These parts are sold through a vendor, but not a dealer franchise. These are “left over” parts or may have been rejected by the actual assembly line at the manufacturing plant. Most have defects somewhere and we refer to them as factory seconds. These parts would be equivalent to what they sell at “factory outlet” stores. These are again cheaper than OE. Salvage: Sometimes referred to as “used”, LKQ (like kind and quality) or recycled. These parts come from a salvage yard and are most likely taken from a “totaled” vehicle due to accident, flooding or storm damage. These parts are supposed to be undamaged and are supposed to be equal to the ones that were removed from your damaged vehicle. Remanufactured: These are damaged parts that have been removed from a damaged vehicle and have been repaired and refitted with some replacement components. These are the categories of replacement parts. I am not here to argue the relevance of these types of parts or who needs to pay for what, but rather to inform you about the different types of replacement parts. So, as you can see, parts are NOT parts. There is a time and place for each one of these categories of parts. You as a consumer need to choose which parts suit your situation. You have the right to request the types of parts you want replaced on your vehicle, but the insurance company has the right to choose which parts they are willing to pay for. They would expect you to pay the difference in price. Their choice will always be the cheapest alternative. We as body shops cannot force an insurance company to pay for something that they are unwilling to pay for. Insurance companies are obligated to you, the vehicle owner, and not the repair facility. This blog is to inform you of all the different types of parts available for your repairs, but the choice is yours! Although we have been enjoying some beautiful fall weather, winter is just around the corner. We know it is coming and you should be prepared for it. Now is the time that we should be thinking about driving in the winter with snow and ice. We at Auto Works Collision Center want to keep your family safe while driving this winter, and have come up with some tips as well as emergency kit ideas. Before hitting the road you can call 511 for Kansas road condition reports. You can keep all of this in a plastic tote. Additionally, some things to remember about your new kit are to keep the flashlight batteries separate from flashlight so they don’t accidentally run down. Keep this kit in the passenger compartment while driving for access in case your trunk freezes shut or is jammed. If you do get stranded, if possible, call 911 on your cell phone. Provide your location, condition of everyone in the vehicle and the problem you are experiencing. Follow instructions the dispatchers give you. Stay with your vehicle! If you must leave your vehicle, write down your name, address, phone number and destination and leave on dash or front seat (anywhere someone can find it). Make sure your vehicle is prepared: Make sure you keep the tank full. Stop and refill if you get below one half of a tank. If you get stuck: Tie the distress flag to your antenna or hang it in your window. At night, keep your dome light on. Rescue crews can see a small glow at a distance. To reduce battery drain, use emergency flashers only if you hear approaching vehicles. If your with someone else, make sure at least one person is awake and keeping watch for help at all times. Avoid Overexertion: Shoveling snow or pushing your car takes a lot of effort in storm conditions. Don’t risk a heart attack or injury. That work can also make you hot and sweaty. Wet clothing losses insulation value, making you susceptible to hypothermia. Fresh Air: Its better to be cold and awake than comfortably warm and sleepy. 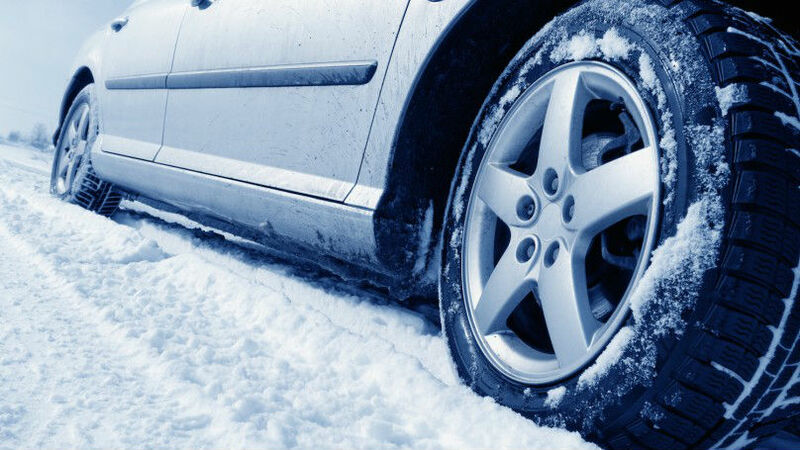 Snow can plug your vehicle’s exhaust system and cause deadly carbon monoxide gas to enter your car. Only run the engine for 10 minutes an hour and make sure the exhaust pipe is free of snow and debris. Keep a window open a crack while running the engine is also a good idea. Don’t expect to be comfortable: You want to survive until you’re found! 1. More crops are being harvested. This time of year the animals sometimes have to travel farther for food sources. 2. There is less cover. When crops are harvested, there is less cover for them to hide and loaf in. Deer travel to find a place they feel safe in and no predators can see them. 3. The days are shorter. This coincides with the movement of deer. They travel more at dawn and dusk. 4. Our paths can cross. The deer movement at dawn and dusk also coincides with our going to work or school around the same time. We go to work around the time the sun rises and we go home from work around the time the sun sets. The chances of these types of collisions are greater because we are both moving around the same times. 5. Hunting season starts. Hunters can cause deer to move around to places they normally do not go. They feel the need to escape the hunting pressure. 6. Mating season. One of the biggest reasons though, is mating season will begin soon. Deer generally mate towards the end of October through the month of November. This is when we see the most auto/deer collisions. The male deer are searching for a mate and pay little if any attention to their surroundings. They are looking for one thing, females. They will travel as far as they have to to find these females. Now that we have pointed out some of the reasons that there are more deer collisions at this time of year, lets see if we can give you some advice on how to limit your chances of this unfortunate type of accident happening to you. 1. Limit your travels as much as you can during the dawn and dusk times. These times with the lower light levels can decrease your vision and reaction times. We may have to travel to work and school, but if you can avoid these times, do so. 2. Drive with your headlamps on high beam. As we just stated, the low light conditions make it hard to see them. Increased lighting will help you see better and at greater distances, however be safe and courteous and dim for oncoming traffic. 3. Pay attention to deer crossing signs. 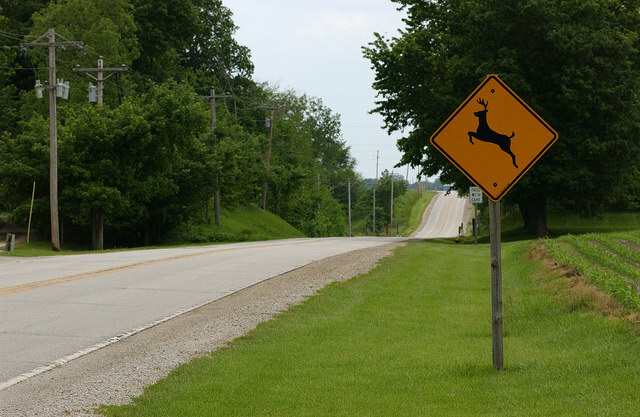 Most states post deer crossing signs in areas that historically have a higher instance of auto/deer collisions. When you see these signs, SLOW DOWN. 4. Watch out for the rest of them! Deer are generally herd animals and travel in packs. They rarely travel alone. If you see one cross the road in front of you, watch for their buddy’s. 5. Travel in the center lane. When the road is four lane and when the traffic permits, traveling in the center lane gives you an additional split second to react. 6. Stay on track. If you see a deer, brake firmly and calmly, and stay in your lane. Swerving could make you lose control of your vehicle and turn a bad situation into something much, much worse. Deer are unpredictable and you could swerve directly into their changed path. 7. WEAR YOUR SEATBELT!!! Out of all of this advice, this is the biggest one that could save your life. So we need to be hyper vigilant looking for deer, especially at this time of year. If the unfortunate happens, here are some things to keep in mind. 1. Pull off to the side of the road as soon as it is safe. 2. Turn your hazard lights on. 3. Call authorities and notify them if anyone is injured or you have damage to your vehicle. 4. Do not approach the animal. You could be injured if the animal is wounded. Wounded animals are VERY dangerous. Let the authorities know if the animal is still in the roadway, making for a dangerous situation for other drivers. 5. Contact your insurance company and start your claims process. Although this is a small list of tips, we hope that you keep in mind that “deer season” is starting. Auto Works Collision Center wants to keep our customers and their families safe. Please share with friends and family. Is my car a total loss? We hear quite often from our customers that “the insurance company totaled my car, but it doesn’t look that bad and I am still driving it.” So today we are going to discuss when and why an insurance company deems a vehicle a total loss. “Total Loss” does not necessarily have anything to do with how bad a collision damaged car looks, rather more times than not it boils down to economics. What I mean by economics is, does the repair cost of the vehicle exceed the value of the vehicle. An example of this is if your vehicle is worth $4000.00 and the repair cost are estimated at $5000.00 then your vehicle would be a definite total loss. Every now and then an insurance company will deem a vehicle a total loss due to structural damage, flood damage or other circumstances, but most of the time it is pure economics. The laws in the State of Kansas cannot force an insurance company to spend more money on repairs than what the vehicle is worth. As a matter of fact, the laws in the State of Kansas will force an insurance company deem a vehicle a total loss when damages exceed 75% of the value of the vehicle on vehicles that are 5 years old or newer. Older vehicles do not apply to this law, but most insurance companies still use the 75% rule on most of the claims. With that being said, an insurance company can deem a vehicle a total loss on a lesser percentage. When an insurance company determines that a vehicle is a total loss, they owe you the current value of the vehicle along with title fees, tag fees and sales taxes. The vehicle can be valued in many ways, but the value is definitely negotiable. There is nothing that is etched in stone as to say your vehicle is worth “X” amount of dollars. There are several factors that determine value. Examples are mileage, options or packages and condition. Mileage is probably the biggest factor as a vehicle with above average miles is worth less than a vehicle with minimal mileage. The same applies with the condition of the vehicle. We advise our customers that when an insurance company starts talking about totaling your vehicle, get your own evaluation. There are again, many ways to value a vehicle. You can do comparison values, meaning that you find a similar vehicle with similar mileage, options and condition and use that as a value. You can use some online services such as National Auto Dealers Association or NADA, Kelly Blue Book or others. Whichever valuation that you use, DOCUMENT, DOCUMENT, DOCUMENT. Your valuation means more with written documentation than with oral documentation. This means print any online valuation or clip newspaper used car ads or even get written valuation from any car dealer. All of this documentation in no way means that they owe you that price, but rather gives you a negotiation factor. It is still up to you to negotiate the value of your vehicle. The insurance company is looking out for their interests, you need to look out for yours. If after all of this you cannot come to an agreement on value, it might be time to seek additional means to settle, up to and including an attorney. OK, we have agreed on value, now what? Once you have agreed on a value, the insurance company “buys” the vehicle from you. Again, they only owe you the value, title fees and taxes, less your deductible if applicable, nothing else. They will write you a check for the agreed price plus the additional fees and they take possession of the vehicle. At that point you can start shopping for a replacement vehicle. Most insurance companies will negotiate with you and let you retain your vehicle. They do this by starting with the agreed upon price and deduct from that what they call “salvage value.” What is salvage value? This is a value that the insurance company would get if they retained the vehicle and sold it at auction. They can’t actually predetermine what the vehicle will sell for at auction, but they more than likely have historical records of what similar vehicles have sold for in the past. Some insurance companies just use a percentage of value, like 25 to 50%. Regardless of which way they determine salvage value, USE CAUTION in determining whether you retain your vehicle or let it go. The vast majority of the time, your settlement offer will not be enough to complete the repairs of your vehicle! We advise our customers to never invest more money into your vehicle that what it is worth. This would lead to what we call being “upside down” in your car. Not a very good position to be in. In rare cases it is worth retaining your vehicle. Examples of this could be if you know your vehicles complete mechanical history, or the vehicle is drivable and you plan on no repairs, like hail damage or storm damage. But again use caution because once you settle, the vehicle is yours! If you decide to repair, any additional damages discovered while in the repair process will come out of your pocket. NEVER make repair decisions that would adversely affect safety. Additionally, repaired or not, your vehicle is worth less money once it has been totaled as it will have a salvage title, and some insurance companies will not re-insure for full coverage. Do what is best for you! Review your circumstances and determine which path benefits you the most. Do not let anyone talk you into doing something that you are uncomfortable with. Consult your repair shop and question them about the possibility of additional expenses before you make your final decision.